The absence of Asian Americans in the media is apparent, astounding and worthy of examination as we enter the month of May, Asian Pacific Heritage Month. Despite Asian Americans being the highest-income, best educated, and fastest growing racial group—as the Pew Research Center calls us—Asian Americans only comprise less than 4% of characters on TV. Recently, the new ABC sitcom Fresh Off the Boat, based on a memoir written by Eddie Huang, has reopened the conversation about racial diversity in the media. Even after Blackish and Empire, two prime-time television shows in which African Americans play major roles, casting Asians as main characters is annoyingly new to mainstream television. Asian Americans have long battled a “model minority” myth in which we are portrayed as more financially, academically, and socially lucrative than other racial groups. Even though Asians are known for tenacious work and family values—which are good things—this stereotype distorts the true ability of each unique Asian American to be perceived as an individual. Although Asian Americans are pigeonholed as excelling in mathematics, not everyone fits into this category, which creates a false expectation for Asians throughout the nation. If employers or recruiters see that a potential employee is Asian, they might expect him or her to excel in math related fields. When I was in high school, fellow students would assume that I was great at math, but I could barely understand the lessons. It made me feel incompetent because I was an Asian that was better at writing than math. This kind of “positive” stereotyping is heavily perpetuated by the media—nearly all Asian characters on TV and in movies are geeks. In nearly every popular TV series, most of the characters played by Asian actors are either in the medical or technological fields. In Grey’s Anatomy, Sandra Oh plays Cristina Yang, a protagonist on the ABC drama who fights her way to the top of Seattle Grace Hospital. She is depicted as the strongest and most ambitious character, but also one of the most conniving and insensitive personalities on the show. Though she is the smartest doctor and graduated top of her class, Yang is often called “robotic” and unemotional, which makes her character unlikeable. Justin Chatwin, a Caucasian actor, playing the role of Goku. The idea that this “model minority” poses an imminent threat to the majority is now called “Yellow Peril.” This noxious stereotype comes to life in Timothy Egan’s “Little Asia on the Hill,” an article that The New York Times saw fit to publish. In this story, Egan interviews a handful of Berkeley students and writes about Berkley’s large Asian community, seemingly blaming an influx of Asian students for a lack of “diversity.” Just as problematically, Egan correlates being Asian and being socially inept. “Berkeley is freighted with the baggage of stereotypes—that it is boring socially, full of science nerds, a hard place to make friends.” The New York Times is a paper of record and should not agree with each columnist, publishing such a racist article was ignorant. When read at face value, it seems as if the author of the article is just releasing statistics about the growing population of Asians and Asian Americans at UC Berkeley. However, he is perpetuating stereotypes and contributing to a flawed argument. Just because one college has a much higher percentage of a minority does not make that college less attractive. Egan implies that the rising Asian population will prevent other ethnicities from attending Berkeley, which makes Asians seem intimidating. The media should not continually support this kind of stereotyping and demonizing of Asian Americans. False perceptions that are created because of this cliché can affect the social and professional images of Asians. “Hollywood whitewashing” is another contributor to the underrepresentation of Asian and Asian Americans. Whitewashing, as Complex describes it, is “a kind of casting where film studios have placed white actors in lead roles under the assumption that the majority of Americans would rather see a white face than a non-white one—despite what the role calls for.” Asian actors aren’t getting the chance to play roles that were clearly written to suit them. For instance, Goku, the main character in the 2009 live-action film Dragonball-Z, is portrayed by Caucasian actor Justin Chatwin. Dragonball-Z was originally a Japanese anime with Japanese characters. The example of a white guy playing Goku is less problematic than earlier examples, such as Mickey Rooney playing I.Y. Yunioshi in Breakfast at Tiffany’s—one particularly egregious example of yellowface. In either case, Asian actors could have been cast, but the roles were given to white actors instead. 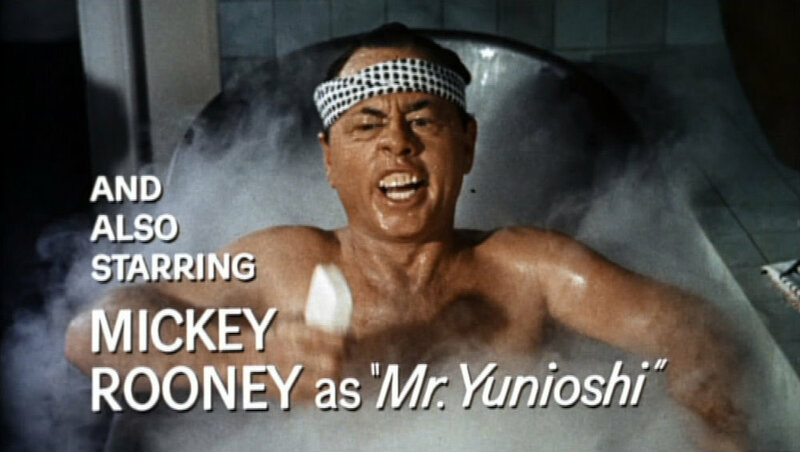 Mickey Rooney, a white actor, plays Mr. Yunioshi in the famous film Breakfast at Tiffany's. Whitewashing not only affects the movie industry, but also professions like journalism. Julie Chen, a popular news anchor on primetime television known for her work on CBS Morning News and The Talk, has admitted to going under the knife to achieve a more “Americanized” look. Chen reportedly had plastic surgery to transform her eyelids, making her monolid, “Asian eyes,” seem bigger. At the start of her career, Chen claims that a previous news director told her, “You will never be on this anchor desk, because you're Chinese…because of your heritage, because of your Asian eyes, sometimes I've noticed when you're on camera and you're interviewing someone, you look disinterested, you look bored.” Chen was obviously hurt by this—it destroyed her self-esteem and offended her sense of heritage. She says, “No one's more proud of being Chinese than I am, and I have to live with the decisions I've made.” Despite being extremely problematic, it is not surprising that many people undergo surgery to fulfill a look that is unnatural to them in order for them to achieve their career goals. The effort to become more “white” or “Americanized” has hit Asian communities hard. Some suggest that the pendulum might have swung a bit too far in the opposite direction. Instead of opening the field for actors of any race to compete for any role in a color-blind manner, there has been a significant number of parts designated as ethnic this year, making them off-limits for Caucasian actors, some agents signal. Many pilot characters this year were listed as open to all ethnicities, but when reps would call to inquire about an actor submission, they frequently have been told that only non-Caucasian actors would be considered. “Basically 50% of the roles in a pilot have to be ethnic, and the mandate goes all the way down to guest parts,” one talent representative said. Julie Chen before and after her cosmetic eye surgery. Fresh Off the Boat has earned many great reviews from audiences. On Rotten Tomatoes, 37 out of its 41 reviews have been positive so far, and only 4 have been “rotten.” This is a step in the right direction for popular media because it gives Asians and Asian Americans more face time on screen. Although Fresh Off the Boat has been a hit for some, Eddie Huang, the show’s writer and producer, tweeted about the imbalance of the show and his memoir. “After [the pilot, the story] got so far from the truth that I don’t recognize my own life. I don’t think it is helping us to perpetuate an artificial representation of Asian American lives and we should address it.” Huang claims that the show has become more “Hollywood” and has strayed from his own reality. Despite its ratings and its rave reviews, Huang wanted the show to be relatable for Asian Americans but believes it has been rewritten to cater to a white audience. In this way, Fresh Off the Boat has not been an entirely accurate depiction of Asian American life, regardless of its contribution to the popularity of rising media with a minority cast. There are countless factors that contribute to the under representation and misrepresentation of Asians and Asian Americans in the media. Even though Fresh Off the Boat and shows like it are progressive, it is important to remember that shows and individual stories are just that—someone’s opinion or interpretation. Natalie Tran, an Asian-Australian YouTube star, recently spoke at Brown University about this subject. She said, “This is one guy’s story or someone interpreting one guy’s story. Doesn’t mean that it’s all of our stories. We’re not all the same.” A whole race cannot be defined by one newspaper article or an episode of a television show, but people should support media that resonates with their own experiences in an effort to encourage diversity. Support the actors and actresses that you can relate to. Share your story with the hopes that one day, racial diversity in the media will be more apparent.